This plug-in helps to correct the distortion that occurs when using ball projection or ball environment textures. The basic idea behind this "ball" texture is that the whole environment is reflected on the surface of a mirror ball. The model used by Maya supposes that the photographer was very far from the sphere, so the region occluded by the sphere - which is obviously not visible - is infinitesimally small. But of course this doesn't hold for real images of mirror balls. Especially if we don't use a professional camera, the invisible portion of the environment is considerable. Why is that a problem? 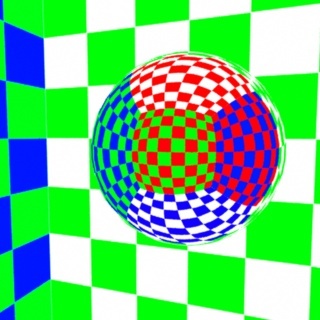 If you take a photograph of a reflecting sphere, scan it and use it as a ball environment texture the 3D ball should have the same reflection as the real one. But because of the model Maya uses to "unfold" the image the result will be distorted. 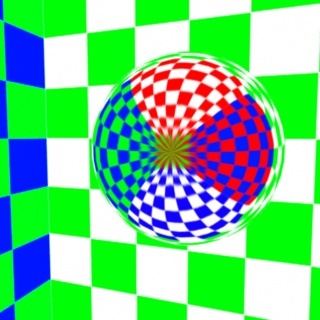 This is illustrated with rendered images. The picture #1 is a rendering of a mirror ball using raytracing. This is like a photograph, since the camera was not very far from the sphere. If we use the image #1 as a ball environment texture and turn off raytracing we get slightly different result. On test #2 the right side is the original "photograph" and the left is the environment texture. The camera position is the same for the images, however the size of the green-white wall is different. The couse of this distortion is even more visible when rendered from the back. 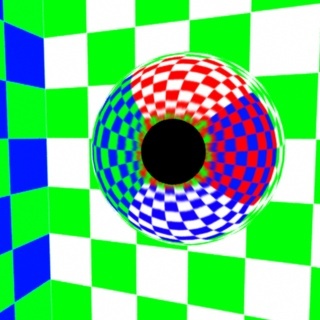 Image #3 was raytraced and image #4 was made using the #1 image as texture. The picture is "streched" to cover the whole environment. If this error is not visible in your project - or you just don't care - stop reading. 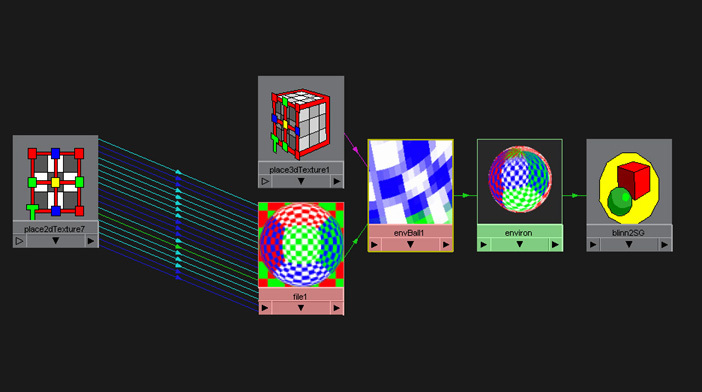 The mirrorBallCorrect plug-in contains a new kind of shading node, called "mirrorBallCorrect". This allows you to "undistort" the texture image, so you can get a result closer to the original. The only drawback is that the region occluded by the sphere remains constant color, since we have no information in that direction. Images #5 and #6 show the results. Note that the raytraced and the textured reflections match - almost - perfectly. Copy the mirrorBallCorrect.mll file to your ...\Bin\Plugins directory. Copy the file render_mirrorBallCorrect.xpm to your ...\My Documents\Maya\4.5\prefs\icons directory (this is supposed to be the image in the hypershade). If you would like this help to be accessible copy the mirrorBallCorrect.html file and ALL the jpg files to your ...\docs\en_US\html\Nodes\ directory. 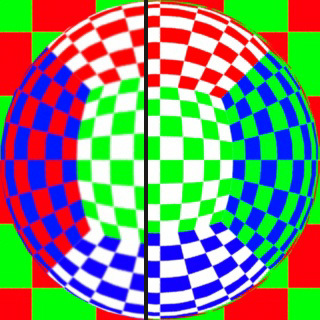 If you use a ball projection or a ball environment texture your shading network contains the image file node hooked in the projection/environment node. The mirrorBallCorrect node has three control-parameters. The attribute "work" turns on and off the node. 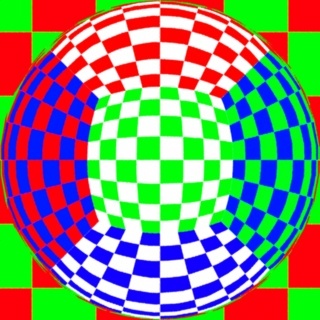 The First_order node sets the distortion of the "central" part of the image, the Second_order sets the distortion on the "back". (Well, they are actually the coefficients of the distorting polinomial). The first should have some small positive number while the second a small negative number.